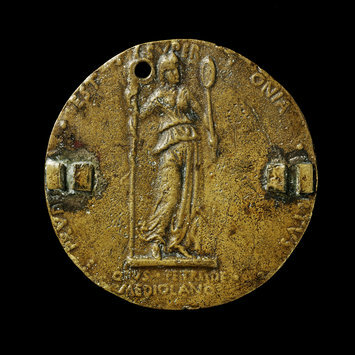 This medal was made by Pietro da Milano and shows the portrait of Marguerite d' Anjou on the obverse and a representation on Prudence on the reverse. Marguerite d'Anjou was the wife of King Henry VI, and thus Queen consort of England from 1445 to 1461 and again from 1470 to 1471 and Queen consort of France from 1445 to 1453. Pietro da Milano was a Milanese sculptor and medallist, who flourished ca. 1450-1473. He was the nephew of Baltramo di Martino da Varese, sculptor and architect. Pietro was engaged in the service of Rene d'Anjou at about the same time as Francesco Laurana and made about 6 medals for Rene d'Anjou, his patron and the Royal family. He was also known under the names Pietro de Martino da Milano, Petrus de Mediolano and Pietro di Giovanni da Varese (or da Como). 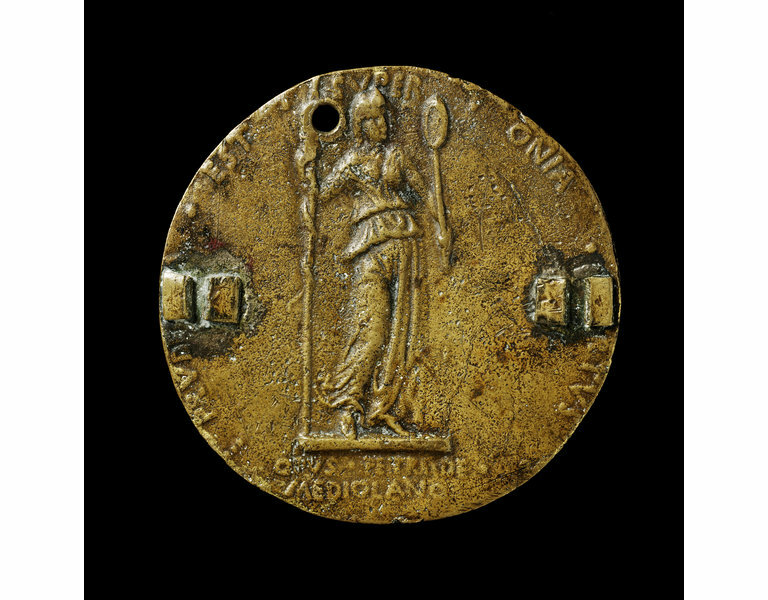 This medal depicts on the obverse the bust to the right of Marguerite d'Anjou, wearing a crown, with an s=inscription. On the reverse is a draped female figure, representing Prudence, standing and holding in her right hand a staff twined with a serpent, in her left hand a mirror. Inscription. Hill, G.F, A Corpus of Italian Medals of the Renaissance before Cellini, London: 1930, 2 vols, cat. 55.